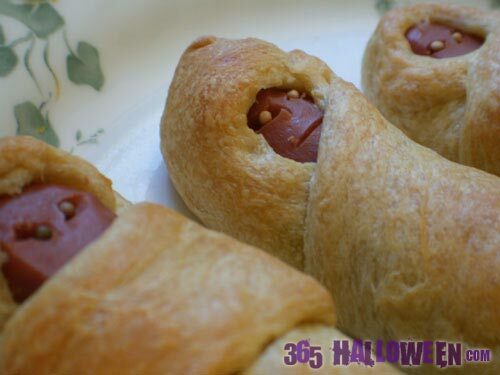 A little bit of presentation turns "pigs in a blanket" into oozy mummy dogs! This is super simple and even healthy if you follow these suggestions. Normally this meal is plenty creepy on its own since hot dogs are made from scrap pieces of various species of dead animals. Eeeew. Just grab yourself a pack of veggie dogs (I prefer Tofu Pups and Smart Dogs), some biscuit dough, and a batch of Green Goo and you’ve got yourself some yummy mummies. Step 1: Make the Green Goo sauce. 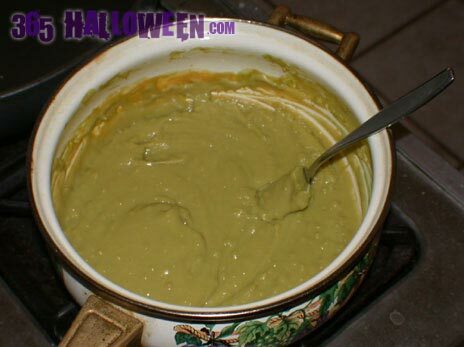 I have already posted the recipe (called “Vegan Cheese Sauce”) on the Post Punk Kitchen website, so just head on over there for the instructions. Also, if you’re feeling gourmet, you can make a swankier version called Vegan Colby Cheese Dip which is AMAZING. After it’s done cooking, put in a few drops of natural green food coloring or add a teeny bit of pureed greens like spinach before cooking (you won’t notice the flavor at all). Step 2: Make your biscuit mummy wrapping. Either pop open a pre-made can (but really, check out those ingredients. Scary!) or make your own from scratch. I used a pre-made can for this demonstration and the flavor seriously lacked because of it. On Halloween night I will be using this recipe. Why not give it try with me? Step 3: Put it all together! I tried making slices in some of my veggie dogs to give the cheese plenty of room to goo around (see picture), but it didn’t seem to make any difference compared to the veggie dogs that didn’t have slices in them. So lay out your biscuit dough (a little bit goes a long way), lay down the dog, put a glob of Green Goo along the length of the dog, and wrap the whole thing up. Although it’s easier to just roll them up triangle style, it looked infinitely better when I meticulously wrapped the dough around several times to look like real mummy wrappings. Pull the dough until it’s thin and wrap, wrap, wrap. Make sure to leave room for the “face” to show so you can do a little decorating. I made slits for mouths and tiny holes for eyes filled with yellow mustard seeds. Pimento pieces for super creepy red eyes, or black mustard seeds would probably make excellent substitutes. 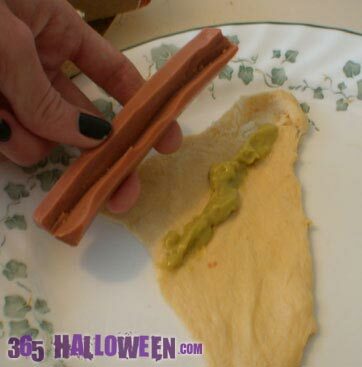 create your own Mummy Dogs with Green Goo. Subscribe to comments with RSS or TrackBack to 'Mummy Dogs with Green Goo'. I am not vegan but I came across this website and I will definately be making these!! I have two little girls and I know they would love them! (They like those vegetable corn dogs) Thanks for the recipe! That is a cute idea!!!! I am planing to make it. hi these were so tasty thanks for the idea! those mummy dogs look great, really creative. 365 Halloween Response: Awesome! It’s so great to see other people’s techniques. Thanks so much for the photo. We hope it encourages others to do the same. Hi i am 18 years old and i have a little brother called Ben and he is in to spooky things like mummies and ghosts. It was his birthday the other day and I made him the mummy dogs with green goo. He love them so much he wanted me to write you people a letter to say thanks for such a great recipe. Thanks lots emily and ben. 365 Halloween Response: Glad you enjoyed the Mummy Dogs, and happy birthday Ben! I just stumbled on page looking for costume ideas, but was so excited to see all the great recipes (my boyfriend is vegan). We are definitely trying the mummy dogs and the bleeding cake looks great too!